Sehion Ministries live web cast from Sehion Retreat Center, Attappady… Saturday, April 2, 2016 Athbhuthangal Theernnittilla. 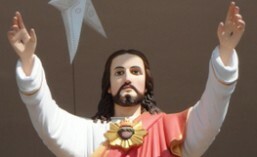 This entry was posted in Sehion Web Live and tagged Adoration, attappady, christian, Fr. Xavier Khan Vattayil, holy spirit, Kerala, Palakkad, palghat, preaching, Sehion - Attappady, sick healing. Bookmark the permalink.